Looking for online strategy books. Here are eight titles that can help any online tournament player. Recommending eight poker strategy titles for online tournament players. When budding poker players ask for advice on how to improve at poker, they are often directed to one of the many online training sites. It is a sign of us living in a digital age. While training sites can, and do, help players to increase their poker knowledge, some will argue there is no substitute for online poker strategy books when it comes to learning about this fantastic game. Head over to Amazon and you will discover close to 500 poker strategy books available to purchase. A significant number of these probably are not worth the paper that they are written on, and will almost certainly be forgotten. But there have been some superb texts written over the years including the ones listed below, all of which can benefit players of online tournament poker. While not specific to tournament poker, David Sklansky’s The Theory of Poker is right up there with the most important poker strategy books ever written. It contains all the basic strategic fundamentals across its 276 pages, much of which are still relevant decades after it was first published. Read this book because it gives you a solid base on which to stack further knowledge. Considered by many to be the poker bible, Super/System was truly ground-breaking when it was published in the late 1970s. It’s original cover price was $100 at release, equivalent to more than $400 in today’s climate, yet it sold steadily for the next 30 years. And even though it appeared well before the online age (and also isn't specific to tournaments), it still provides a great deal of insight and knowledge for online tournament players. At 600 pages, the book is on the larger side, but there is golden information on all of those pages. Super/System was the first book that showed how the most successful poker players approached the game, moving towards loose-aggressive play in hold’em games, plus it gives tips and strategies for several other popular poker variants, with some of those strategies coming from some of Brunson’s peers. Gus Hansen is one of poker’s most unorthodox players, yet nobody can argue with his tournament results, which include three World Poker Tour titles. While playing in the 2007 Aussie Millions Main Event, the Great Dane made notes about every hand that he played, giving his thought process for each. Oh, he also went on to win the tournament for A$1.5 million. Once you begin reading Hansen’s book, you’ll find it difficult to put down until you have read it cover to cover. While Hansen’s style of play is not for the fainthearted, it does give you an insight into how to play a loose-aggressive style in poker tournaments. The 1995 World Series of Poker Main Event champion’s first Harrington on Hold’em volume is the best-selling poker book in history, and it is easy to see why. Much like Brunson’s Super/System, Harrington on Hold’em gave poker tournament players a glimpse into how to approach the different stages of a tournament, the “M” concept (which is still relevant today), tips on bluffing frequencies, and other such nuances. Harrington on Hold’em: Volume II arrived soon after — this writer believes this is the best of the series — with Volume III completing the tournament series. Some of the information in Harrington on Hold’em may be a little outdated as it advocates a mostly tight-aggressive approach, but it lays great foundations for anyone looking to enter the world of tournament poker. This is another entry that isn’t focused on playing advice, but it is still possibly one of the most useful poker strategy series around. Often, you will find that the difference between a winning poker player and a losing one is how strong the person’s mental game is. Once you have read both of Jared Tendler and Barry Carter’s books, you will be armed with the tools necessary to understand how the human psyche works, to recognize you are about to tilt, and to employ strategies and thought processes for improving your mental game. You can even apply the concepts to other areas of your life. One of the more recently written books to make it onto our list is Excelling at No-Limit Hold’em by Jonathan Little and 17 others such as Mike Sexton, Jared Tendler, Phil Hellmuth, Chris Moneymaker, and former PokerNews managing editor Chad Holloway. 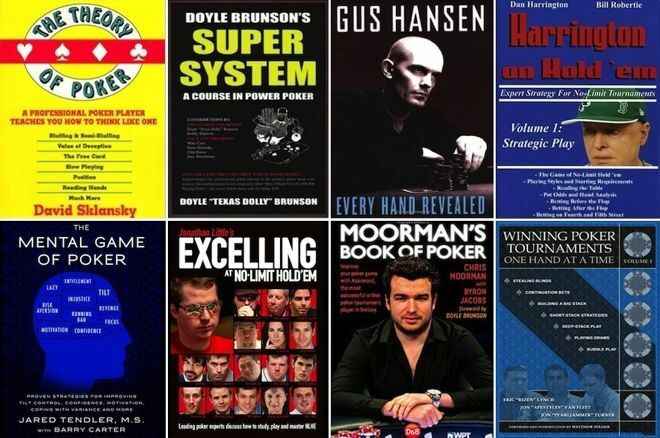 Some say the book is like a modern day Super/System, in this case covering several areas of no-limit hold’em, and a title worthy of shelf space for any poker player. Few books captured the imagination of the poker community before they were launched more than Chris Moorman’s book. The winningest player in online poker tournament history released his book in November 2014 and is essentially Moorman reviewing various hand histories from tournaments played by co-author Byron Jacobs. Moorman has shied away from poker training sites, so this could be the only way you get to delve inside the mind of one of online poker’s legendary tournament players. Winning Poker Tournaments One Hand at a Time is a three-book series that gives the reader a step-by-step guide into decision making across a wide range of different scenarios. The books are packed full of hand examples taken from the hand histories of Eric “Rizen” Lynch, Jon “Pearljammer” Turner, and Jon “Apestyles” Van Fleet, three players who have combined winnings of more than $10 million.